Yes, you read the title correctly: I'm writing one of my rare how-to posts. 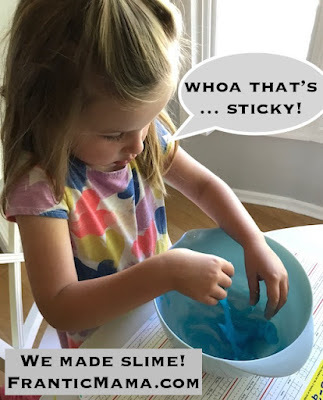 But first, a little backstory: All summer, my daughter asked if we could make slime. She saw it on some silly kids channel online and was dead set on making her own. 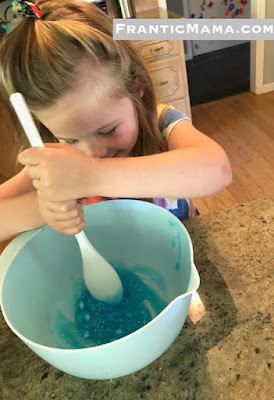 Plus, she loves anything having to do with mixing and measuring. All summer long, I put it off. "Sure, sure we can do that...at some point." Well, all the sudden, it was the last day of summer break, and I felt pretty crummy-- we still hadn't made the darn slime. I'm happy to report, however, I pulled up those shirtsleeves and we did it. We made slime. The incredible part was that for the recipe I found, we actually had all of the ingredients (there were only 3, but still). Ready to show your kids you still have a little fun left in you? Baking soda, glue, and contact lens solution. 4-6 oz. glue (we used the blue glitter kind, naturally; or, if you're using white glue, you can simply add glitter into the mixture). This is not a perfect science. Play around to get the consistency your kid likes. Here comes the tricky part-- NOT-- You mix it all in a bowl. Mixing was her favorite part. We added more baking soda than the original recipe to make it thicker. That's it! She got her slime, and I got...a sticky bowl and a happy kid. P.S. I used old dishcloths to scoop out the slime and throw it in the trash when she was finished. I didn't risk putting it down the sink and clogging everything up! What "fun" activities did your kids convince you to do recently?